Born at Frome in Somerset, William Bennett moved to London at an early age with his parents who opened a woollen drapery shop at Southwark. 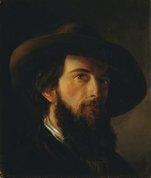 He subsequently ran the family business for several years before selling it in 1841 to pursue a career as a full-time artist. 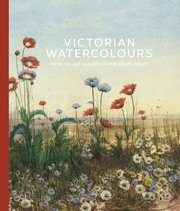 The next year he exhibited his first work at the Royal Academy, and in 1848 became a member of the New Society of Painters in Water Colours (later the Institute of Painters in Water Colours), to which he contributed regularly over the following two decades. The facts about Bennett’s artistic formation, however, remain vague. Contemporary commentators saw him as a devoted follower of David Cox, and the testimony of his art clearly indicates the influence of the older artist’s distinctive style. Cox had many pupils in the 1840s, and Bennett was very likely one of them. Certainly, the two painters worked alongside each other in 1847 during Bennett’s sketching trip – the first of many – to Betws-y-Coed in North Wales, which Cox had helped popularise as a place of artistic pilgrimage. Bennett, like his mentor, was an insular artist and preferred to paint the British countryside – Yorkshire, Wales, Scotland – and scenes of the south coast of England. The Art Gallery of NSW’s small, sprightly sketches are not conventionally finished watercolours and appear to have been painted on the spot, capturing the features and feeling of the landscape with loose handling and economy of means. Working on thick, coarsely grained paper, Bennett used a dry brush technique for the lighter areas, especially in Women working in a field , breaking up the flatness of the washes by dragging the brush across the surface and allowing exposed areas of the paper to suggest flickering light.